Note: This is Part 2 of a 3-part series about the Past, Present, & Future of the Wedding Industry. To receive future blog posts by email, sign up for this blog. In Part 1 of this series “The Past, Present, and Future of the Wedding Industry“, I shared some of my thoughts about how the Wedding industry has changed over the past 15 years. I’d like to dive into three more areas in the Wedding market. In this post, I cover Wedding Registries, Wedding Attire, and Wedding Websites. Let’s dive in. Past: When I got engaged in 2002, my fiancée and I registered at two stores: Macy’s and the now-defunct Kitchen Etc. We spent several hours at each store on a weekend day to fill up our registry list. In the store, we used a registry gun and ran around to scan the items we wanted. The system we used was fairly new, and it didn’t work very well. The scanners were slow, and we created duplicate items on the list. I also distinctly remember that we had to settle for what we were able to scan in the store. If it wasn’t available for sale on the shelf, we couldn’t put it on our registry. For our guests, these registries were less than ideal: Kitchen Etc. had an in-store kiosk where you had to print out the entire registry to choose something from the list. Macy’s registry was online, but it was slow and the in-store system didn’t update in real-time. As a result, we got two identical KitchenAid mixers. Present: Thankfully, wedding registries have gotten a lot easier for both couples and guests. There have been several technological and digital advances, including the ability to sync registries from different stores thanks to sites like TheKnot and MyRegistry. • The Knot Registry lets couples review retailers and compare registry benefits. It also offers registry tips and ways for couples to customize their registry. The registry profile can easily be shared via the couple’s Knot wedding website, a personalized email, or enclosure cards. • MyRegistry is a great site if you want a few items from multiple stores. 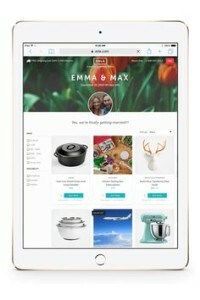 The site can pull all of your registries into one, and the app enables you to add gifts from your phone. Couples can also compare prices to find the best price on gifts and save their guests some money. And if couples register for more expensive items, guests are able to contribute to a portion of the gift’s cost. • Honeyfund goes beyond your typical wedding registry, letting guests and well-wishers buy couples experiences instead of toasters and towels. Guests can contribute to airfare, lodging, or excursions and experiences related to a honeymoon trip. Future: As new technologies like RFID and image recognition software improve and become accessible to consumers, I believe the concept of shopping will evolve. And that will likely impact the wedding registry business. For example, instead of being limited online or in-store, imagine if a couple could build a registry as they went throughout their day. Whether online, watching TV, or even when they see an item at their friends’ house, a couple could quickly tag items they like with their mobile phone. This kind of technology isn’t as far off as it may seem. In fact, the company Slyce “activates visual product recognition on existing product images or by simply snapping a photo.” They are already working with Neiman Marcus, and the demo video, is really neat. If these new forms of commerce come to fruition in the next 15 years, it will have a big impact on the lucrative wedding registry business. Past: When I got engaged, my future wife spent a lot of time with her girlfriends shopping for a wedding dress and bridesmaid dresses. She told me that the process caused frustration on many levels: it took her a long time to find the dress she wanted (she estimates six separate shopping trips that were each several hours), she spent a lot of money on the dress (the cost of wedding dresses now averages $1,357) and she felt a fair amount of guilt when she asked her closest friends to buy dresses that they all knew they would only wear once. My wife literally hasn’t seen her wedding dress since the day we got married — her father had it dry cleaned and put away (and no, we don’t expect our daughter will ever wear it!) Ah, tradition. As for me, I had to coordinate my groomsmen’s tuxedos, and it was like herding cats. I sent detailed instructions to them by email, and had to fill out individual paper forms with the information for the tux shop. If I remember correctly, I even had to mail the forms in! • For the bride-to-be that’s willing to rent a dress, Borrowing Magnolia lets brides-to-be buy or borrow designer gowns at a fraction of the retail cost, and women who own a bridal gown can sell or rent it out on the site. • Bridesmaid dresses are now easily available for rent at new businesses like Vow To be Chic and Union Station. These sites “make bridesmaid dress shopping fun again” and help coordinate matching dresses for your closest girlfriends, regardless of where they live. • For the guys, companies like Men’s Warehouse have technology and apps to help you manage your crew. 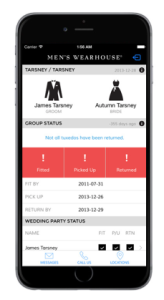 The Wedding Tuxedo Group Manager app helps you track sizes, keep tabs on the group’s rentals, and will even alert you after the wedding when the tuxes have been returned. Awesome. Future: Over the next 15 years, I expect more and more brides and bridesmaids will become comfortable with the idea of renting a dress for their big day. Just like no one could have predicted the success of AirBnB (house-sharing) or Zipcar (car-sharing) the next generation of millenial women don’t have the same revere for sole ownership and old traditions. For those who still want their own dress, I expect that technological advances in textiles will enable more brides to get a completely custom dress at a fraction of today’s prices. We’ve already seen this kind of innovation in the jewelry market with customized engagement rings — and it’s only a matter of time until brides can create the exact dress they want. Past: As a budding web entrepreneur back in 2002, I decided to create a wedding website for our special day. At the time, I used an HTML template from Macromedia Dreamweaver (now part of Adobe). The process to create a website was terrible and very limited. I remember that I spent hours and hours fixing small layout issues, even though I knew very few people would actually visit the site. To get the site live and on the Internet, I bought a domain and used an FTP client to upload the files. To make a change, I had to upload the entire site again. The final result was a rudimentary website that conveyed the information I wanted, but not in a compelling way. • Wedding-focused sites like MyWedding, The Knot, WeddingWire, and Minted all offer free wedding websites that include photo galleries, your registries, and easy communication with your guest list. You can also choose a template that offers matching printed invitations. 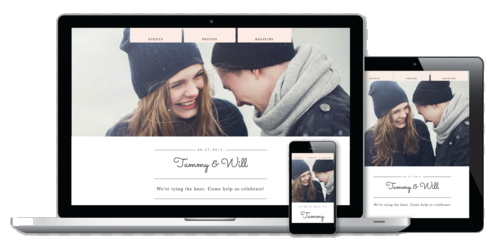 • Website builder apps like Wix, SquareSpace, and Weebly offer dozens of templates to create a mobile-optimized wedding website that can be customized to look exactly how you want. • AppyCouple is a slick and feature-rich app that helps you create your own personalized app, customized to your personal style. Future: Over the next 15 years, I expect the technology to create wedding websites will become more mobile-centric. The millenial bride uses her mobile phone as her primary computing device, and many of the existing wedding-site builders don’t yet have easy-to-use apps available on the Apple Store and Google Store. I also expect Wedding Save the Dates and Invitations will become part of the wedding website user experience, which will have significant implications for how a couple manages their guest list and RSVPs. At Punchbowl, we’re watching this trend closely as we see more and more of the Wedding market shift to digital. More on that in the last part of this series. COMING NEXT: In Part 3 of this series, we’ll take a look at Wedding Save-the-Dates and Wedding Invitations — two topics I know quite a bit about given my background at Punchbowl. Do you have thoughts about this post or about how digital is transforming the wedding industry? Please get in touch! Thanks for taking the time to read. Beautiful wedding, thank you for the positive photo.